In that vein, they’ve unleashed the Brain Fitness line of puzzle games, offering all sorts of exercises to challenge you one-on-one and put your puzzly skills to the test. They sent us copies of three Brain Fitness games to review, each with its own distinct flavor. Solitaire Chess presents you with various layouts of pieces on a 4×4 grid, challenging you to clear the board of all but one piece. Every single move must eliminate a piece until only one remains. Even the beginner puzzles gave me pause at first, because the need to knock out a piece with every move is a very different style of chess than I’m accustomed to. But I very quickly got into the groove of plotting out the chain of moves necessary to clear each board. With two pawns, two knights, two bishops, two rooks, a queen and a king, there are myriad layouts of varying complexity to solve, and some of them were serious brain melters. Oddly enough, I found some of the expert-level grids easier than the advanced-level puzzles, though you could easily spend five or ten minutes on a single crafty puzzle. Not only is it a terrific mental exercise, but it just might make you a better chess player in the long run. Chocolate Fix is a marvelous variation on the Sudoku model, offering nine sweets of varying shape and color, and tasking you with deducing the intended position of each in a 3×3 baking sheet. The beginner-level puzzles are child’s play, and would actually be a terrific introduction for younger puzzlers. But as soon as you reach the intermediate-level challenges, the difficulty begins ratcheting skyward. Some clues give you colors only, others shapes only, and the occasional clue is centered around a given piece’s location on the baking sheet. Midway through the advanced-level challenges, they stop referencing specific sweets at all, leaving you to do some serious deductive work with shapes and colors alone. By the time you reach the expert puzzles (which abandon any clues providing all nine squares, leaving you to mentally assemble Tetris-like pieces with shape and color symbols), it becomes a serious mental workout that banishes any false confidence and bravado that the easy early rounds might’ve sparked. Victory may be sweet, but Chocolate Fix’s later challenges will make you earn it. Rush Hour is a variation on the classic sliding-tile game, except instead of tiles, you’re sliding cars and trucks back and forth in order to clear a path for your heroic little red car to escape the traffic jam. 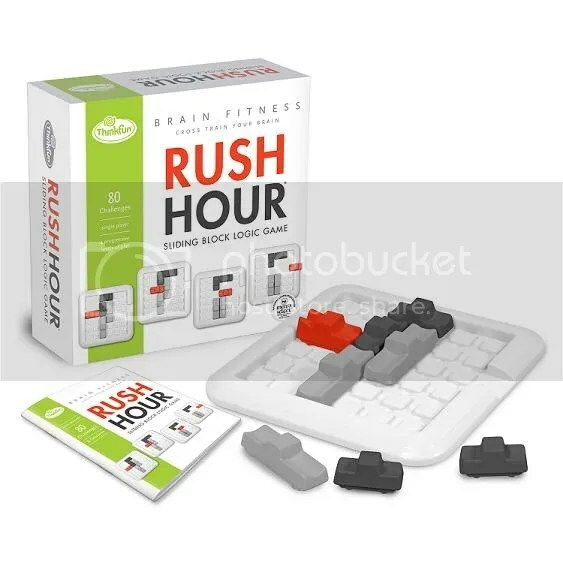 Rush Hour (in various forms) has been a great success for ThinkFun over the years, and the Brain Fitness version is a brilliantly simple adaptation. Self-contained and perfect for puzzling-on-the-go, Rush Hour takes the chain-move thinking of Chess Solitaire to the next level. The jump from beginner-level to intermediate-level challenges is a sobering one, if only because the playing grid seems absolutely packed with cars! But you quickly realize that a packed grid means fewer possible moves, which helps to point you toward the solution. The grid thins out again when you reach the advanced-level puzzles, but greater movement only leads to tougher challenges, since so many more moves are available to you, requiring chains of increasing complexity in order to rescue your little red car. 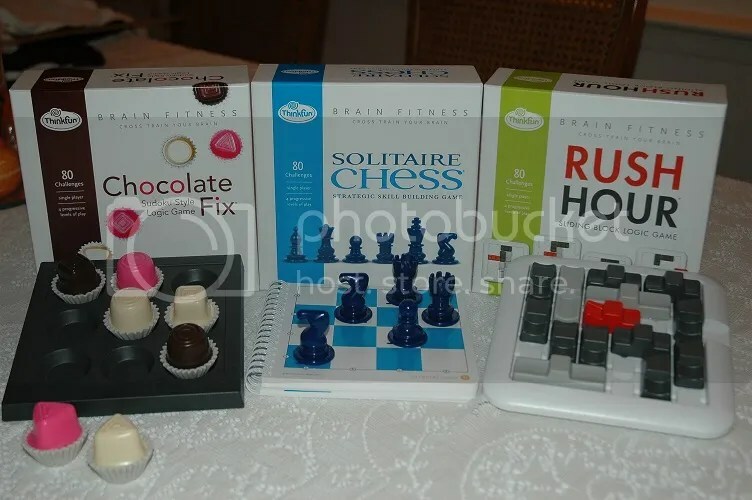 Having thoroughly tested all three games, I found Rush Hour the most difficult of the three (though Solitaire Chess wasn’t far behind), but I must admit, the multilayered colors / shapes / positioning clue style of Chocolate Fix provided the most unexpected challenge. As an experienced puzzler, I was thoroughly impressed by the scalability of each idea. The easy puzzles were terrific introductions to the game, and the expert puzzles were challenges quite worthy of your time. ThinkFun recommends 15 minutes of puzzling time a day with any of their Brain Fitness products in order to give your brain a proper workout, but I suspect you’ll have a hard time stopping there. If only physical workouts were as much fun as these mental ones! Thanks for visiting the PuzzleNation blog today! You can like us on Facebook, follow us on Twitter, cruise our boards on Pinterest, check out our Classic Word Search iBook (recently featured by Apple in the Made for iBooks category! ), play our games at PuzzleNation.com, or contact us here at the blog! 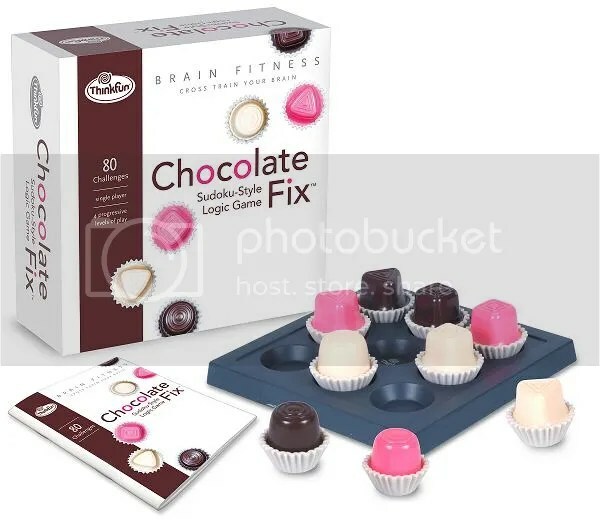 This entry was posted in Games, PuzzleNation and tagged Brain fitness, brain fitness chocolate fix, brain fitness rush hour, brain fitness solitaire chess, Brain teaser, chocolate fix, games, Geeking Out, Laser Maze, Mazes, product review, PuzzleNation, Puzzlin' fool, Review, rush hour, solitaire chess, Sudoku, ThinkFun, thinkfun brain fitness by gmdirect. Bookmark the permalink.